In Españolé Spanish School, we pull out all the stops to put on activity programmes designed to encourage students from all over the world to learn the language of Cervantes in the city of Valencia. During the week, there are intensive and super intensive classes of up to five hours daily from Monday to Friday, which are complemented by cultural and leisure activities afterwards, and the weekends provide the opportunity to go on trips and get to know the Region of Valencia. There are even courses that combine Spanish learning with sports, such as sailing and football; everything necessary for students with particular interests and with very different profiles. 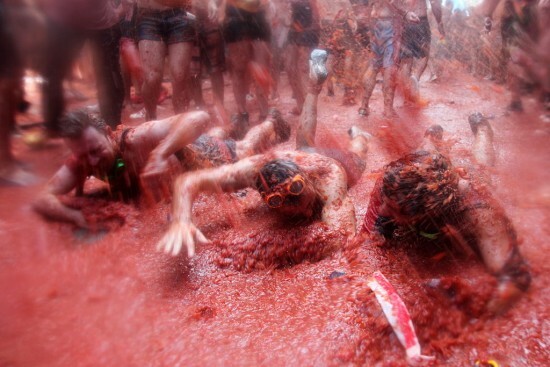 Adult students and those who are more adventurous may sign up for La Tomatina, a festival that from word of mouth between friends has achieved world-wide fame and is the goal of large numbers of tourists who each year come to Valencia for this reason. 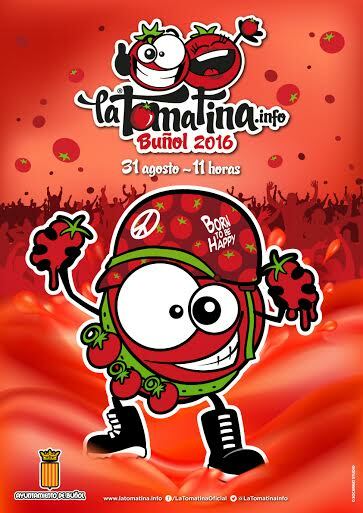 You´re sure to have seen images of this spectacular festival, since 2002 declared of `International Tourist Interest´, and which consists of a peaceful fight through the streets of Buñol, armed only with ripe tomatoes. Every year on the last Wednesday of August, this battle takes place between 11 and 12 am. Its beginnings go back to a fight among friends during a parade in 1945 that was resolved by flinging tomatoes at each other. For fun, they repeated the tomato fight again the following year, and with each passing decade the festival grew in popularity throughout the world, even overcoming times when it was banned, until in 2012 45,000 people took part. 140 tons of tomatoes are thrown in one hour to the delight of both locals and visitors. For two years now, La Tomatina has been regulated, and it is now necessary to purchase a ticket in order to be able to take part under close supervision, with a maximum capacity of 22,000 people. We advise you to check out the rules and advice on the official website in order to enjoy the experience to the full. Remember, the event takes place this coming 31 August. However, as well as La Tomatina, Buñol has an interesting historical and environmental heritage to experience in order to finish off a visit to this inland location in the province, just 40 kms. from Valencia. Just outside the town, you can enjoy bathing in the cool waters of the natural pools of the Cueva del Turche, and there is a 20 metre waterfall, as well. Its gorges, wells and other natural features make Buñol a favourite stop for lovers of rural tourism. Within the town itself, there are some must-visit stops. 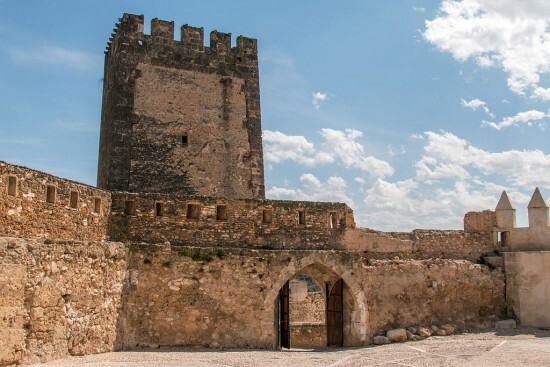 Buñol castle, dating from the XIII century, used to mark the frontier between the Kingdoms of Valencia and Castilla during a majestic age because of the strategic location. It consists of two areas, one military and the other, facing to the south, the residence of the lords of Buñol. In this part, you should visit the Palacio de Mercader, dating from the XIV century and which now hosts the Archeology Museum; the Iglesia del Salvador containing the Ethnology Museum, and the Palacio Gótico. Along the Paseo de San Luis, you can also find the Ermita de San Luis Beltrán, the work of José Brel in the XIX century, and the Iglesia Parroquial de San Pedro Apóstol, a neoclassical building from the XVIII century and worthy of consideration. Finally, the Molino Galán (molino = mill) is a good example of the pre-industrial heritage in an area which is to the forefront in the paper and cement industries and whose factories give it an unmistakable profile. A get-away to Buñol is both original and different, don´t you think?